Gusty Moderate Winds: No Problem! The e-book Making Soft Kites provides help for all 5 Soft Series designs. Arriving at the field, skies were nearly completely blue and a healthy breeze was ruffling the tree tops. On pulling out the wind meter, I discovered it had jammed. Those normally reliable little cups just didn't want to spin today. A mechanical problem as it turned out later. At home, I gave the Windtronic meter a shake and the cups freed up! Let's hope they stay that way. The device has had the odd knock during it's lifetime. 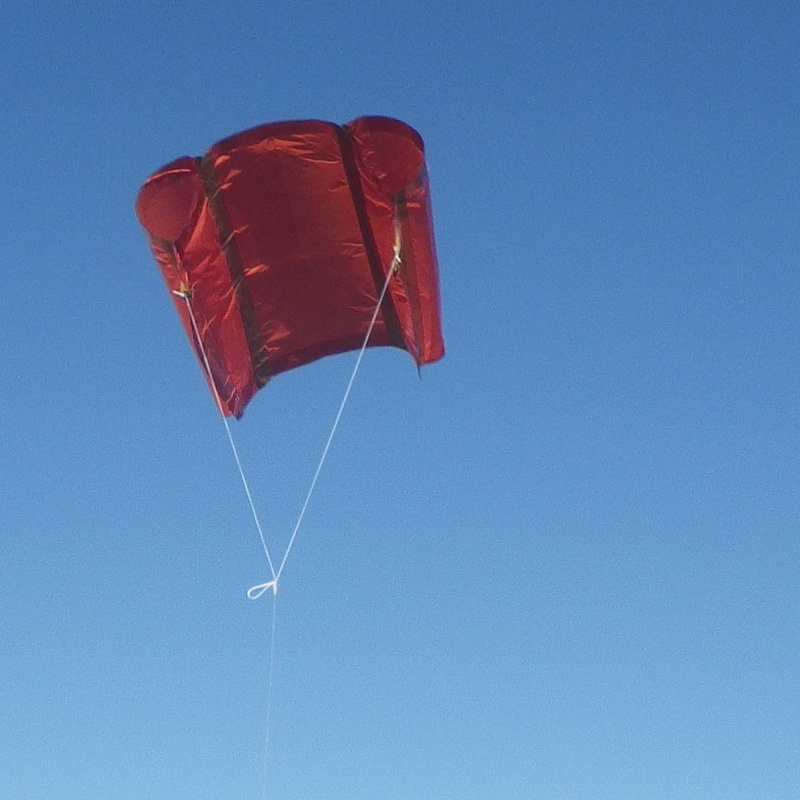 A soft sled kite is not quite as easy to launch as a delta, since it does takes a moment or two to get some air pressure into the big ends of the cells. But as soon as they popped out, up went the kite. Minor creasing was apparent for a while but with the kite higher and gulping more air, the cells soon firmed up and flight became more balanced. With the kite on not much more than 10m (30ft) of line, several photos were taken. That out of the way, the line was let out to 30m (100 ft) for a while and then 60m (200 ft). On this length, full zoom was required to get some decent video. What a pity about the lack of cloud! A cloudy backdrop shows up a kite's movement so well. 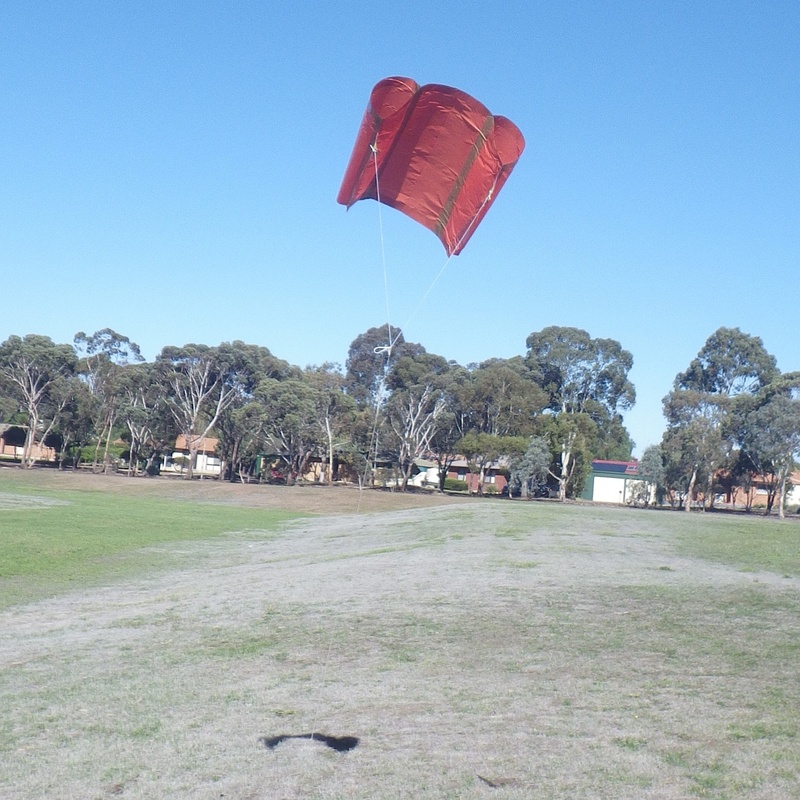 In the windy conditions the Soft Sled kite was often accelerating up and then slowly dropping back. Not much side-to-side flying and no looping around at all. A credit to the original Pocket Kite which inspired this design of mine! A small flock of lorikeets flew past at low level, together with some other small birds. 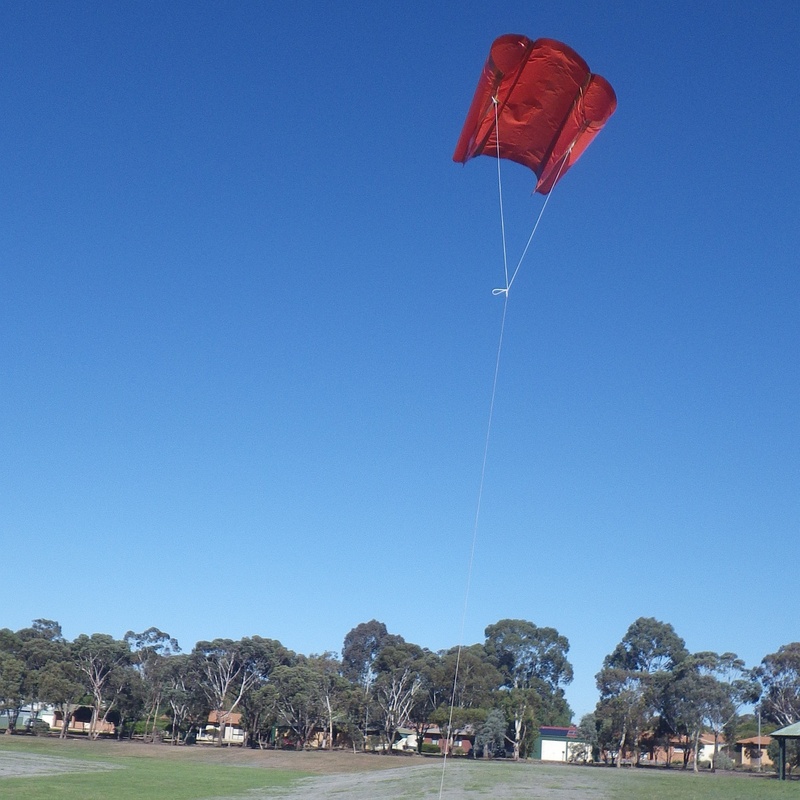 Although the kite was only 60cm (2 ft) tall, it was pulling very firmly for its size. That would partly be due to the wind speed, but also because Sleds of all kinds have a decent pull on them! Despite this, the 50 pound Dacron had a fair amount of sag. I think wind drag had a lot to do with that. Bringing the kite down was straight-forward, although the inflated plastic resisted with higher tension in the line as it was wound back onto the heavy wooden winder. As the Soft Sled passed down through 100 feet off the grass, I noticed it was at a fairly steep line angle. This often happens when you pull a kite in, since you are changing the direction of the 'relative wind'. Upwards in this case, which made the kite fly steeper. It must be said that the Soft Sled kite has a great wind range for something of such modest size. With gusts around 30kph it didn't even look uncomfortable. Perhaps it will stay stable right up to the high 30's or low 40's. Time will tell! 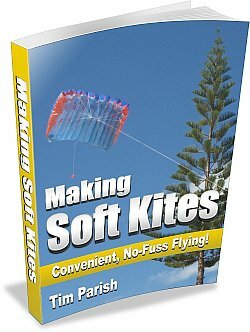 Don't forget that the Making Soft Kites e-book provides help for all 5 Soft Series designs.